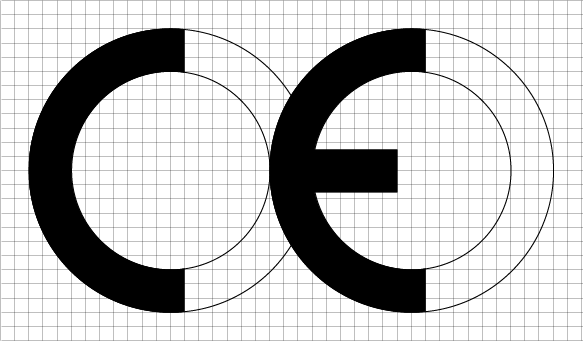 CE is the abbreviation of the french phrase “Conformité Européenne”, which could translate to “European conformity”. 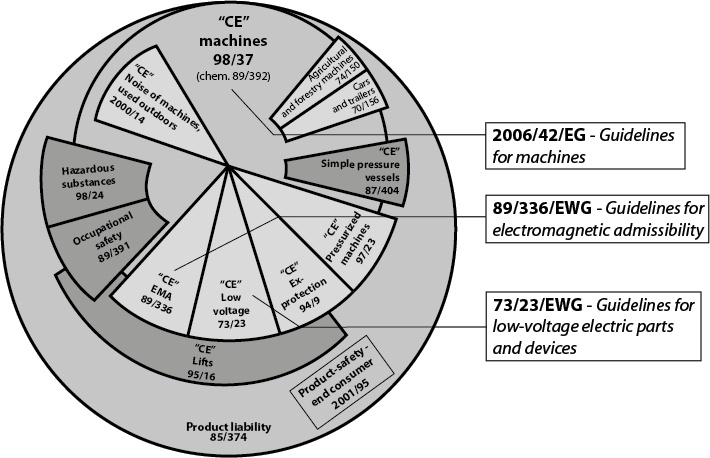 The CE sign is used in the european community (EU, EFTA) and ensures, that a certain product is produced in accordance to strict rules and regulations regarding safety, health, environmental protection, adequate quality of products and proceedures, … Not all products on the european market have to comply to these standards, but a vast majority of home appliances, equipment, toys and all industrial and medical appliances, machines and equipment has to be certified. Products, manufactured outside Europe, also have to be certified. Since the manufacturing process is certified from raw material to the finished product, that sometimes includes certification of foreign subcontractors. Items marked red are frequent in our production program or are frequent parts of our projects. Who is obliged by CE? CE rules and guidelines are mandatory for the manufacturers (SMM) as well as the clients (employers). 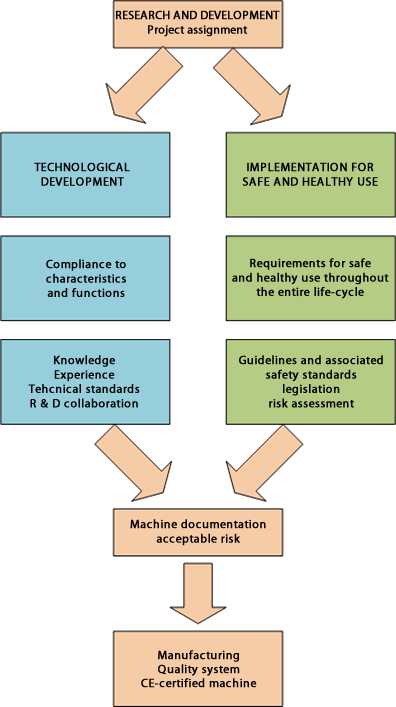 The manufacturer’s obligation is to analyze the risk according to the standards (EN ISO 12100-1 and 2, EN 14121-1) with the goal of minimizing risk to an acceptable level and providing adequate warning about potentional hazards. At SMM, we complie to these standards by designing our constructions to be safe, implementing technical safety precautions and extensive information about safe use. train and educate the employees. 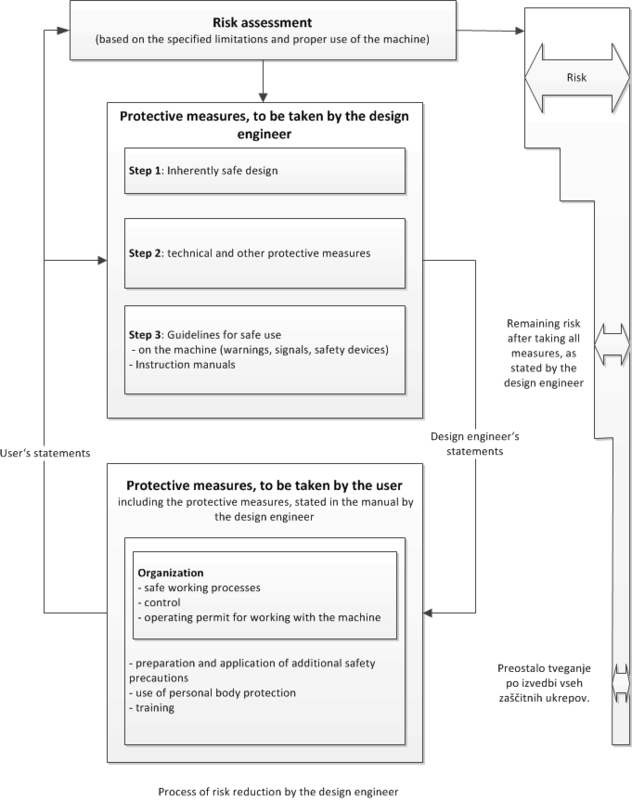 PLANNING is the first step, which begins long before the assemply.At this stage, we asses the feasibility by taking the safety standards into account and draft a safety concept with risk analysis during all stages. Furthermore, we prepare the documentation for building, assemply, testing, use, disassembly and recycling. RISK ASSESSMENT is a key step for the prevention of injuries and health hazards, because we consider risks, dangers and hazards of all kinds. This way, we can ensure safe use of the products, if the instructions are followed. 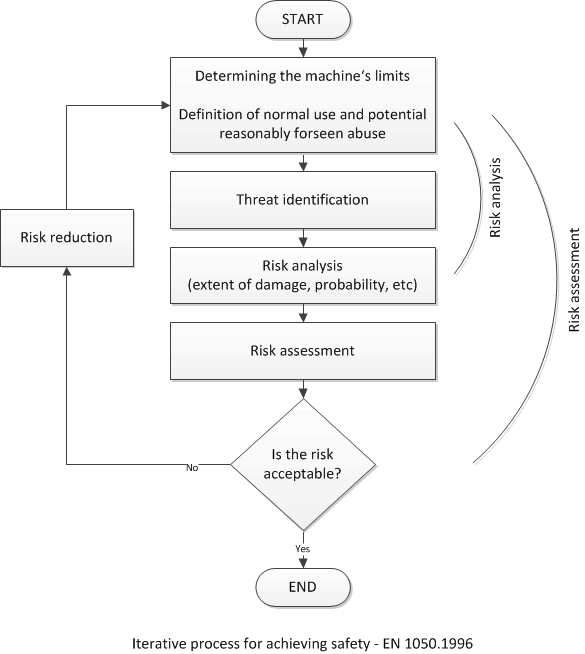 We also compose a security manual for all risks which may not have been eliminated (acceptable risks by the FMEA method – Failure Mode and Effects Analysis). RISK REDUCTION is pictured. All the risks are eliminated or reduced, until the remaining risks are acceptable. 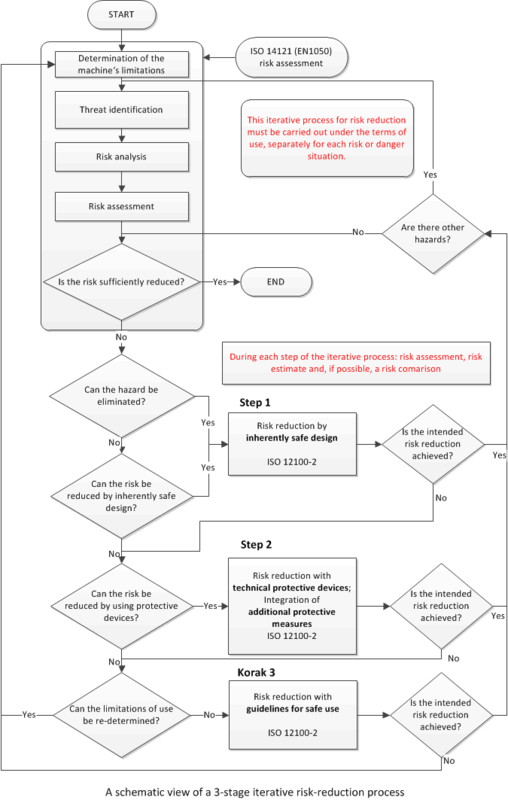 ITERATIVE METHOD is a three-step process, which serves for systematic searching of possible risks and allows their elimination or reduction. FABRICATION must be performed in accordance with the guidelines and plans, since this is the only way all safety precautions are taken into account. Also, safety demands of the products are checked regularly. After fabrication, the entire system is probationary assembled, tested and set up. 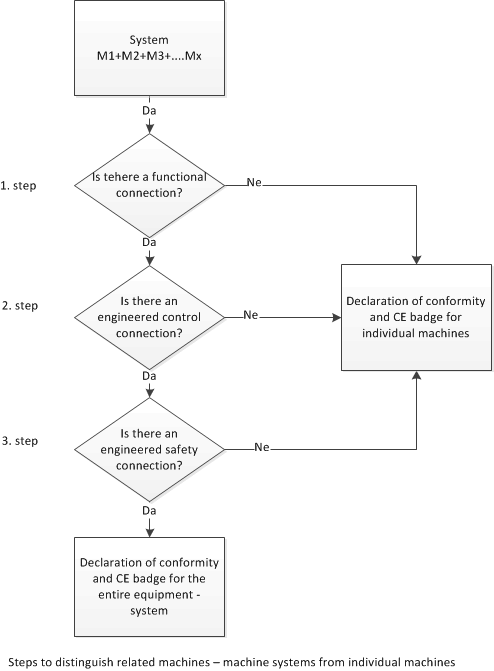 This way, we can assure safe operation of the machine within the framework of safety demands. After the succesfull test-assembly, the technical documentation is prepared. HANDOVER / DELIVERY is the last step of machine building. At the HANDOVER/DELIVERY, the certificate of accordance is issued and the CE badge installed. We present the machine and the safety concept to the client and determine the suitability of the machine and the enclosed spare parts. Also, all necessary documentation (operation instructions, specification of usage in accordance with the intent, safety warnings and precautions, list of allowed and prohibited changes and supplements) is included. We also issue safety warnings for all remainig risks and place them (if necessary in the client’s native language) onto the machine.